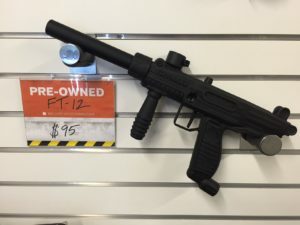 Looking for a used paintball gun? Want the best bang for your buck? Stop in at Splatball in Minneapolis any day of the week and browse the largest selection of used paintball equipment in Minnesota! Splatball buys, sells and trade paintball gear everyday of the week! So whether you are looking to upgrade or simply trade in your gear we can help! Splatball has a growing selection of both new and used gear weekly. Curious what we have in stock? Check our EBAY store above or our Used Gun Page. Want to sell some old gear? Splatball buys, sells and trades all paintball gear! 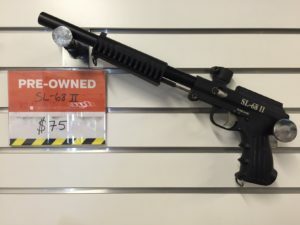 Stop in today to check out all of our latest and greatest merchandise and don’t forget to take a look at the used gun selection! We are home to Dye Paintball’s only Service Center in MN and the only store with multiple certified paintball technicians on-site. 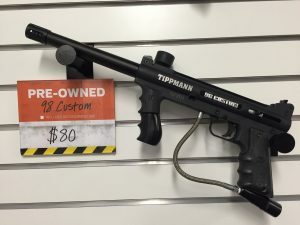 All paintball guns and equipment is thoroughly inspected and rebuilt before being sold in our used selection. 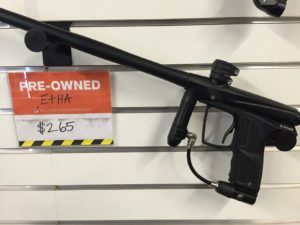 All used paintball guns and equipment is sold completely “as-is”. We also always have pre owned goods such as masks, pants, jerseys, tanks, loaders and parts on hand. Don’t see something you are looking for? Give us a call at 612-378-0385!